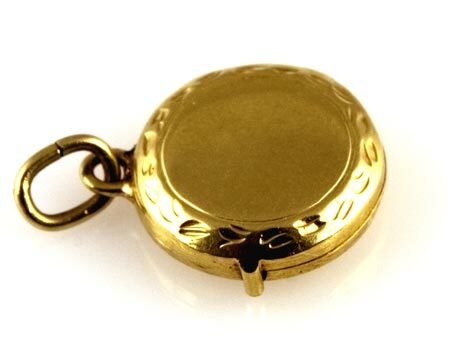 Compacts have never gone out of style which is why this vintage charm version is so special. It has very fine detail around the rim, with a polished center. The case opens and snaps securely shut. A jeweler could easily put a tiny mirror in the top and a puff could be added in the bottom for complete perfection. Tests 14K. 10.1 mm (0.40 in.) across excluding the bail and hinge. 1.0 grams.